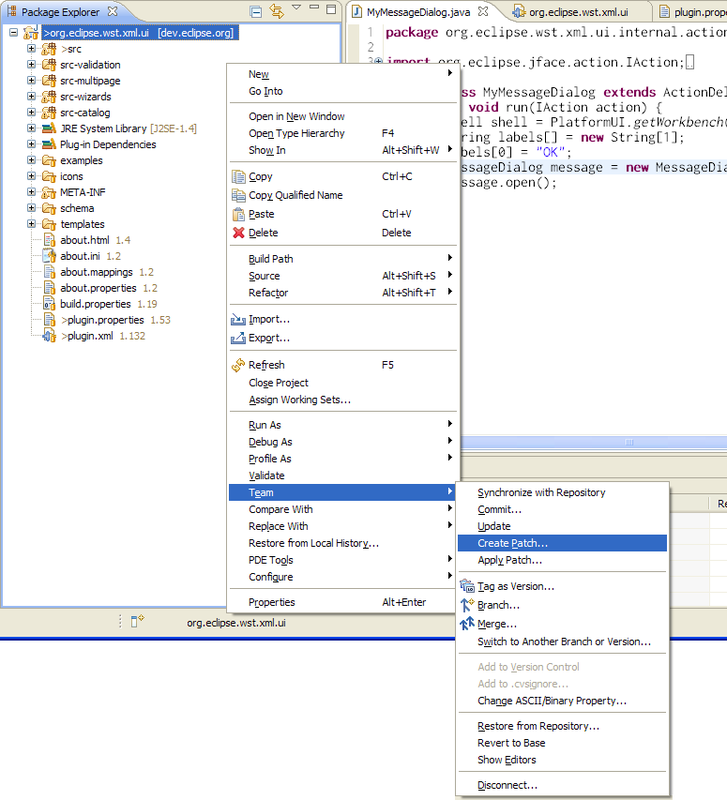 This tutorial shows you how to set up your Eclipse environment to develop or modify the Web Tools Platform (WTP) project plug-ins. First we will discuss how to connect to the CVS repository to check out the WTP source code. We will then set up our Target Platform. Next we will make a modification to the WTP source and run our Eclipse Application. Finally, we will create a patch for our change, which we could submit to the WTP project. To follow this tutorial, you will need either the Eclipse SDK or otherwise have the Eclipse Plug-in Development Environment (PDE) installed. It will also be much simpler if WTP is already properly installed and running. Use of the versions of Eclipse and the Prerequisites listed on the download page is strongly encouraged. A working knowledge of Eclipse concepts such as the Workbench, Editors, and Views, is also required. For more information about these concepts, consult the Workbench User Guide. Access the source code for the Eclipse Web Tools Platform from the Concurrent Version System (CVS) repository. 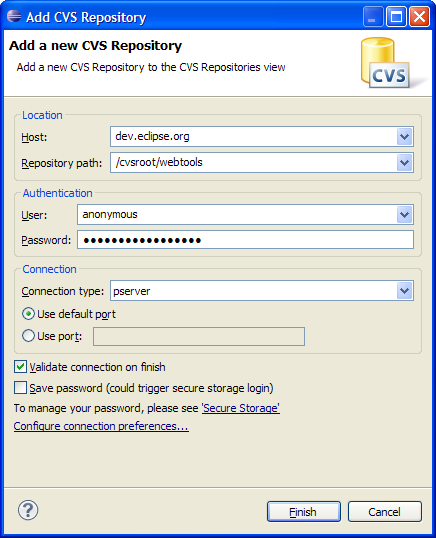 To access the CVS repository select Window > Open Perspective > Other and select CVS Repository Exploring. Password: You can leave this blank, but it's courteous to use your email address. Navigate through the folders and find the plug-ins that you are interested in having the source for. The most recent code is in HEAD. The subprojects listed on the WTP home page each have an area in the WTP CVS repository under which you'll find their features, plug-ins, documentation, examples, and other development goodies. For this tutorial	we will modify the XML UI plug-in, org.eclipse.wst.xml.ui, which is part of WTP's Source Editing project. The corresponding workspace project's folder can be found in the CVS repository as sourceediting/plugins/org.eclipse.wst.xml.ui under HEAD. Add the source into your local workspace by choosing Check Out from its context menu. Switch back to the Java perspective. The plug-in will now be a project in your workspace. Although not runnable in this form, Plug-in Projects such as this fill many a Committer's workspace. The Target Platform contains the Eclipse plug-ins which your workspace projects will be compiled against. Having all of your own plug-ins as well as their dependencies in your workspace as plug-in projects means Eclipse will be spending time on code you aren't actively working on. A well prepared Target Platform prevents this but still allows you to compile and run your modified code, all while using fewer resources. The default target platform is the Eclipse installation you are using. For more information on setting up Target Platforms, consult the Plug-in Development Environment Guide. As an example, we are going to add a new action to the context menu on XML files in the Navigator view. First we need to add an extension to the plugin.xml file. Open the plugin.xml file for the org.eclipse.wst.xml.ui plug-in project you just checked out. Add the following to the plugin.properties file. This will be the text of the label that appears in your new pop-up menu. In the Project Explorer or Package Explorer expand "src" and right click on org.eclipse.wst.xml.ui.internal.actions and select New Class. 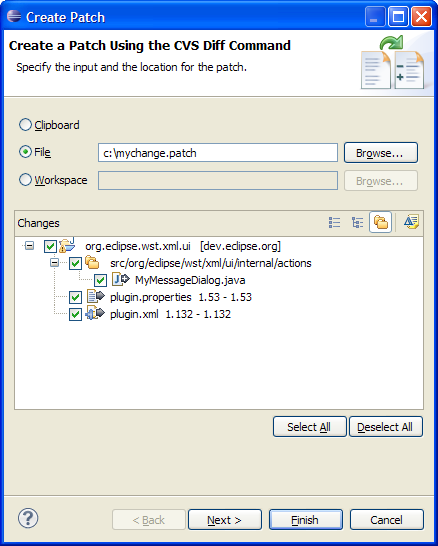 In the Run dialog select the Eclipse Application option, then select new. Enter the location of the desired workspace (or accept the default), and select Run. When this Eclipse Application is run, it's essentially running the configured Target Platform, except that the plug-in projects in your workspace are used instead of the corresponding plug-ins in the target. We need a project in the workspace to test this on. Select File > New > Example > Editing and Validating XML Files. 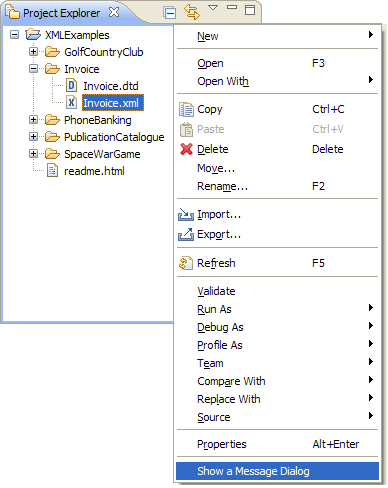 Right click on any XML file, for example Invoice.xml. Notice that the new option "Show Message Dialog" has been added to this menu. Select "Show a Message Dialog." A message dialog appears. To contribute an enhancement to WTP, you can submit your code changes as a patch. In the Project or Package Explorer view, right click on the modified Plug-in Project and select Team > Create Patch. Select "Save in File System" and enter the file name. Select Next. Ensure the Diff Output Format is set to "unified." Select Finish. The patch has been saved to your file system. If this were an actual feature enhancement the patch could be submitted to the WTP project as an attachment using Bugzilla . In this tutorial you learned how to set up your Eclipse environment to get started developing Web Tools Platform plug-ins by creating a simple addition to the user interface.